I am excited to highlight the powerful impact VtSBDC had on Vermont’s economy in 2017, the 25th year of our organization. Our confidential, no-cost advising allowed small businesses to gain access to more capital to finance their business growth than in 2016. As a result of our assistance, VtSBDC clients reported a 16% increase in sales while average Vermont small businesses had a 3% increase in sales. Employment levels of VtSBDC clients increased by over 21% compared to an increase in employment of less than 1% for Vermont businesses in general. 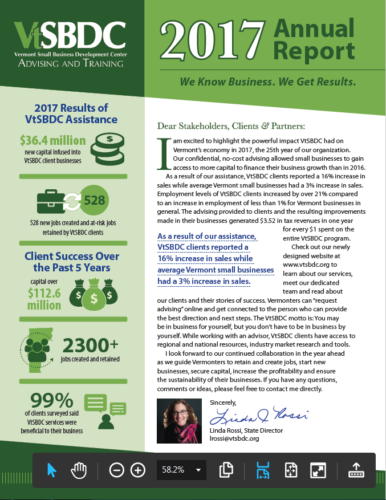 The advising provided to clients and the resulting improvements made in their businesses generated $3.52 in tax revenues in one year for every $1 spent on the entire VtSBDC program. Check out our newly designed website at www.vtsbdc.org to learn about our services, meet our dedicated team and read about our clients and their stories of success. Vermonters can “request advising” online and get connected to the person who can provide the best direction and next steps. The VtSBDC motto is: You may be in business for yourself, but you don’t have to be in business by yourself. While working with an advisor, VtSBDC clients have access to regional and national resources, industry market research and tools. I look forward to our continued collaboration in the year ahead as we guide Vermonters to retain and create jobs, start new businesses, secure capital, increase the profitability and ensure the sustainability of their businesses. If you have any questions, comments or ideas, please feel free to contact me directly. CLICK HERE TO VIEW THE FULL REPORT NOW!